We knew that it had to happen sooner or later, but … I did not know I would feel this emotional. I mean, we’ve been through so much with Edgar Wright, Simon Pegg and Nick Frost. Zombies, murderous townsfolk, explosions, ice cream. 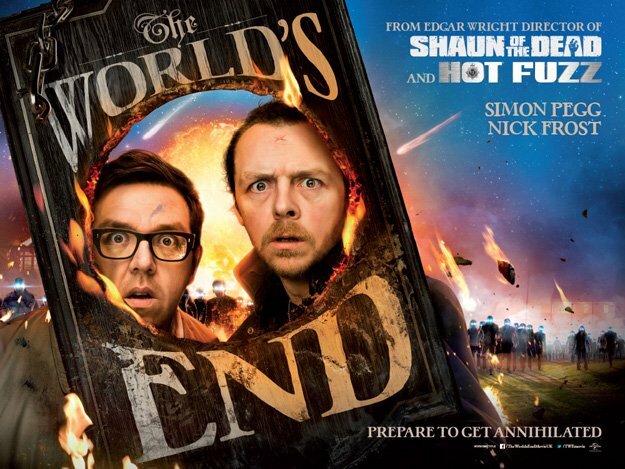 And now, because it really cannot end any other way: the Cornetto trilogy comes that much closer to the end with the first trailer for the final installment: The World’s End. The World’s End has been very cleverly marketed, with much of the plot kept strictly under wraps, and now with the release of the first US trailer, we have an actual taste of that final, sweetest Cornetto. For those that don’t know what the finale to this loose trilogy will entail, here’s the plot: five friends reunite in their hometown to do one last major pub crawl, ending at The World’s End pub. But all is not hunky-dorey, and there’s a good chance that more than the fate of their livers is hanging in the balance. The big question about The World’s End was … well, what’s going to happen? Who are the monsters this time? The trailer answers that, resoundingly with: ROBOTS! Much like the idyllic little town in Hot Fuzz, the village in The World’s End appears to have been invaded by robots, replacing the actual townsfolk. At least, that’s what I got from this first trailer. It looks like more of the same humor that made Hot Fuzz and Shaun Of The Dead so very enjoyable: bromance, the puncturing of idyllic small town life, pub crawls, murderous creatures bent on destruction. All very English, all very funny. Awesome? Yes. With a cast that includes Pegg and Frost, along with Paddy Considine, Rosamund Pike, Martin Freeman and Eddie Marsan, this looks like a fitting end to the trilogy. Screw superheroes: this is what I’m waiting to see. The World’s End arrives in US theatres on August 23, 2013.